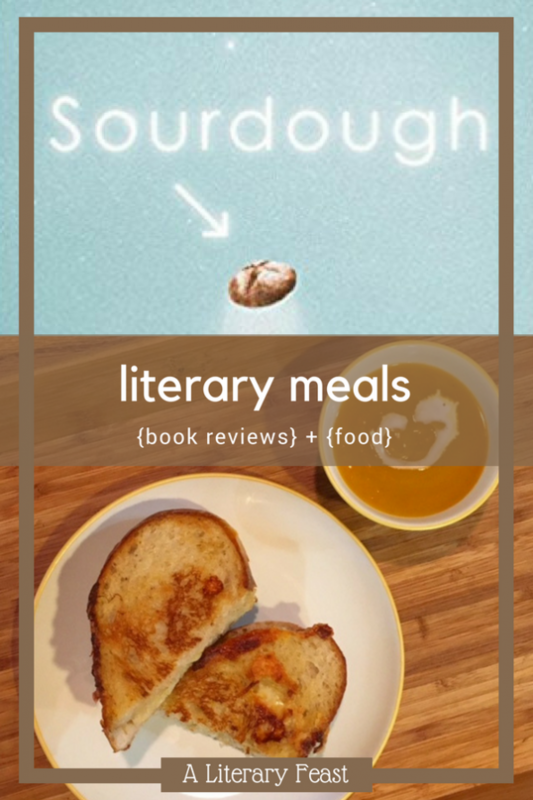 Hi, I’m Megan, stopping by from my own literary-food blog, The Hungry Bookworm, to share a post with you today. I was so excited to stumble upon Grace’s blog recently, and when we got to chatting, I was even more excited to find someone I could call a kindred spirit. We decided to do some guest posting, to bring a different viewpoint to our readers, but on the same wonderful topics of food and books (and occasionally, Gilmore Girls). Thank you so much to Grace for letting me share a typical post with you. As you’ll see, I usually do a quick review of a book I’ve read and pair it with a recipe mentioned in or reminiscent of the story. Let’s dive right in, shall we? Many of you may be familiar with Robin Sloan’s Mr. Penumbra’s 24-Hour Bookstore, which came out a few years ago and was quite popular with book clubs at the time. 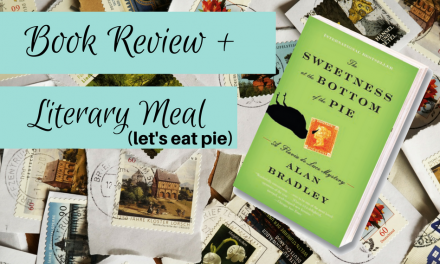 In fact, I came to read it through my Good Reads & Good Eats book club last year, and we enjoyed our dinner-discussion at a pizzeria because pizza seemed like the best “24-hour” food option to accompany it. When I first heard about his new novel through the Book of the Month club, I was intrigued. I remember Mr. Penumbra’s not being exactly as I expected, though as a book about books (one of my favorite faux genres), it was an enjoyable ride. To follow that up with a book about food (another favorite faux genre) seemed too good to be true. 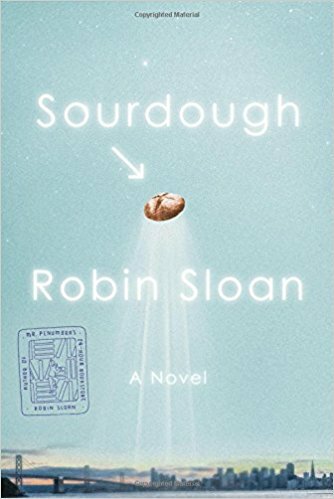 Sourdough by Robin Sloan went on my TBR list immediately, and within a few weeks, I’d finished it. The novel centers around Lois, a software engineer from Michigan who moves to San Francisco to work at a robotics company, where she works so hard, she ends up practically moving in. When she does make it home, she’s too tired to do much more than order takeout and collapse. One day, a quirky homemade menu shows up on her doorstep; Lois has no idea it’s about to change her life. She quickly becomes a regular, favoring the “double spicy” and getting to know the owners by name. As fate would have it, the owners, brothers Beoreg and Chaiman, must leave their restaurant behind in a hurry and decide to leave their sourdough starter in Lois’ care. Though she isn’t exactly a baker, she takes to the task and seems to become an expert in the unique bread and it’s magical starter. Like in his book-about-books, Sloane colorfully paints an underground world of food that is completely unknown to outsiders. Exploring that world with Lois is as interesting as it is entertaining, but mostly it just left me wanting to tackle a loaf of sourdough bread. At one point in the novel, the chef at Lois’ company becomes a sourdough customer and uses it to prepare a bunch of what I can only imagine were amazing grilled cheese sandwiches for the hungry, overworked employees. I took this opportunity to use a cookbook I’d once bought devoted to grilled cheese called Grilled Cheese Please! that I knew would have the perfect pairing. Thankfully, it did. The sandwich is called Hog Island Grilled Cheese, and according to the description, it’s a “favorite among San Franciscans.” It uses sourdough bread and has four kinds of cheese… need I say more? I went to a specialty shop near my old apartment in Eastern Market that I knew would have any kind of cheese I needed. I was able to get exactly the amount required for the recipe, and they didn’t disappoint in their selection. I was also able to get a loaf of sourdough bread from a local bakery while I was at it. I have a method I typically use to make my grilled cheese, which I’ll describe here. 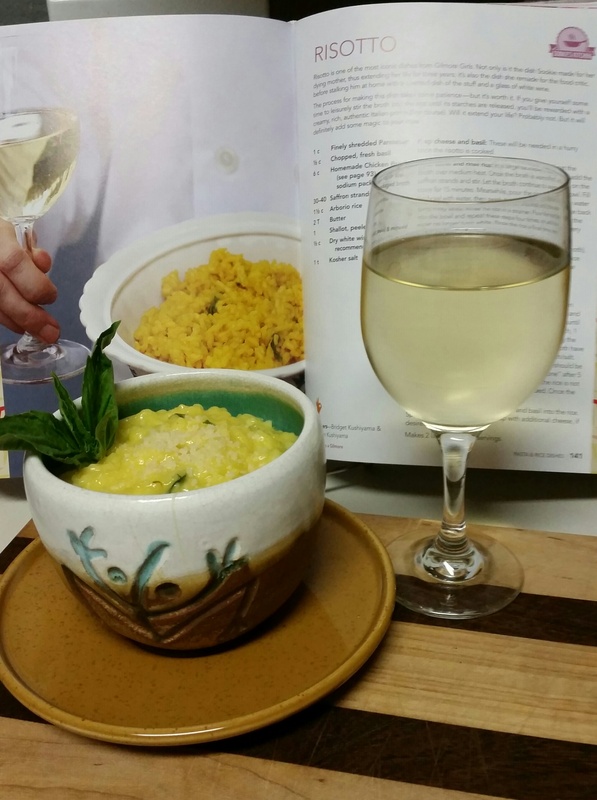 To follow the cookbook’s directions, see recipe at the bottom of the post. First, I gathered my ingredients and made sure to prep all of them. Grilled cheese can move sort of quickly, and you don’t want to be scrambling for the ingredients as you go. 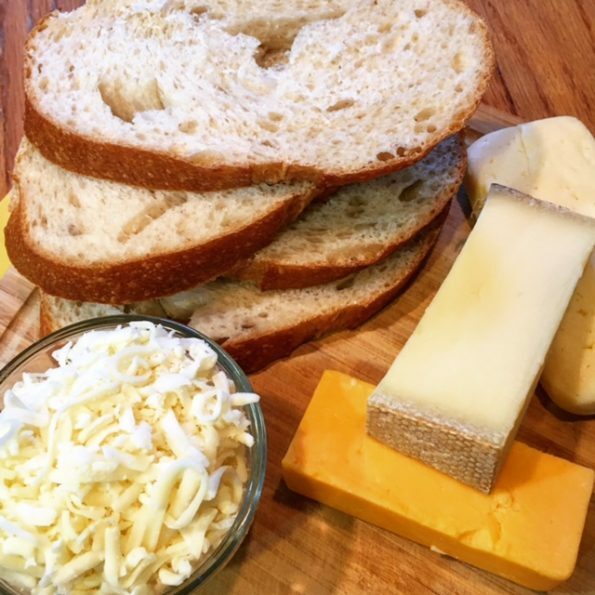 I cut the bread into slices a bit on the thicker side and grated each of my cheeses in turn. When finished, I combined all 4 of them into a bowl, to make the assembly a little less of a “process.” I preheated my pan over medium heat, while I buttered half of the bread slices. Be generous with the butter, making sure you spread the layer all the way to the edges. As I went, I set each one in the pan, buttered side down. I topped the each piece of bread with the combination of cheeses, heaping it on. It’s okay if some falls onto the surface of the pan as you go. It can help to create those crunchy cheesy ends of grilled cheese sandwiches, which I love. I turned the heat down to medium-low, while I buttered the remaining bread and set each slice atop its pair. 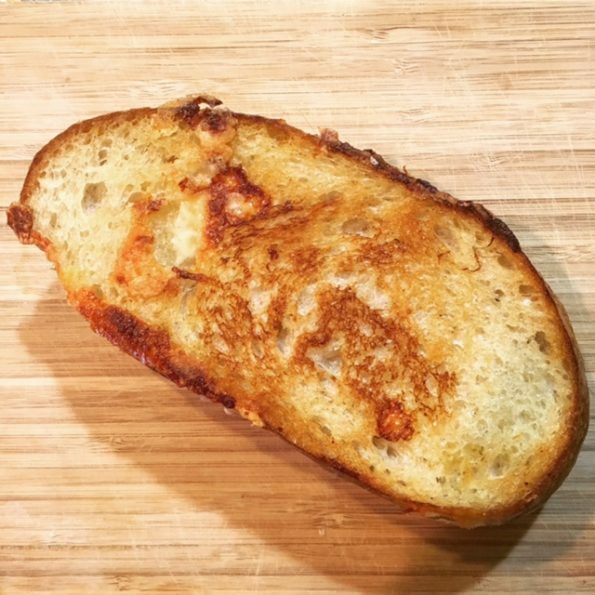 I typically make grilled cheese nice and slow, over medium-low heat (except at the very beginning and end), which allows the cheese to fully melt and allows the bread to get nice and crispy and golden without burning. Once the sandwiches had cooked for 5-8 minutes, the cheese was starting to melt nicely and the slices on the bottom were lightly golden, I flipped each sandwich. I allowed them to cook for another 5-10 minutes; the cheese continued to melt and the bottoms became a darker golden brown. I flipped it one additional time, so the first side of the sandwich could also achieve a darker golden color and I could be certain all of the cheese was fully melted. 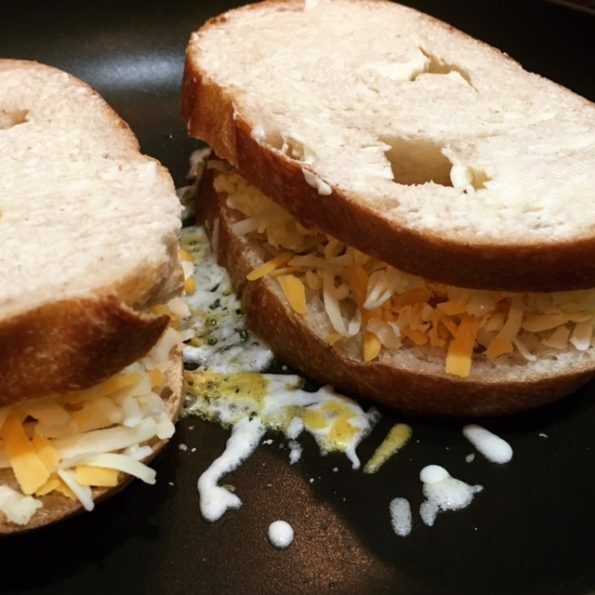 I removed each sandwich from the pan and allowed it to cool for one minute before slicing – otherwise the cheese oozes out too quickly. 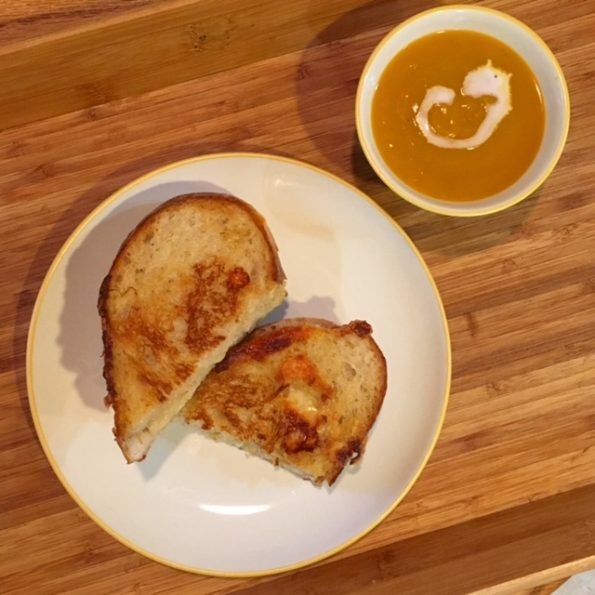 These grilled cheese sandwiches would be wonderful on their own for lunch, but since we were having them for dinner, I served ours with a delicious Butternut Squash Soup from Gimme Some Oven (one of my favorite fall recipes, here). The sandwiches were as delicious as promised, and definitely did Sourdough justice. My favorite thing about using sourdough to make them was that the little nooks and crannies allowed the cheese to create gooey pockets within the sandwich, and in some cases, it melt through to the surface and get a bit crispy. If you have any grilled cheese tips or recipe combinations you’d like to share, please comment below. 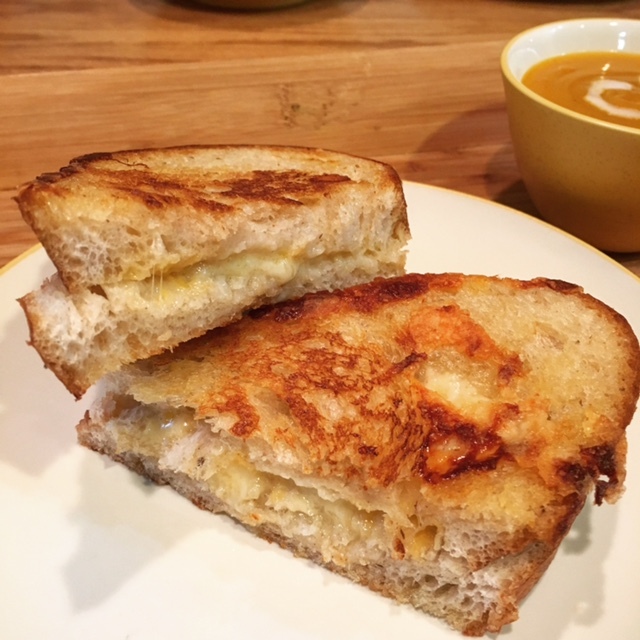 Enhance your reading of the book Sourdough by Robin Sloan with this easy and delicious grilled cheese sandwich. To assemble: Butter one side of each slice of bread. Place 4 slices, buttered side down, on your work surface. Spread the fromage blanc on each slice. Layer with the Gruyere, cheddar and Havarti slices. 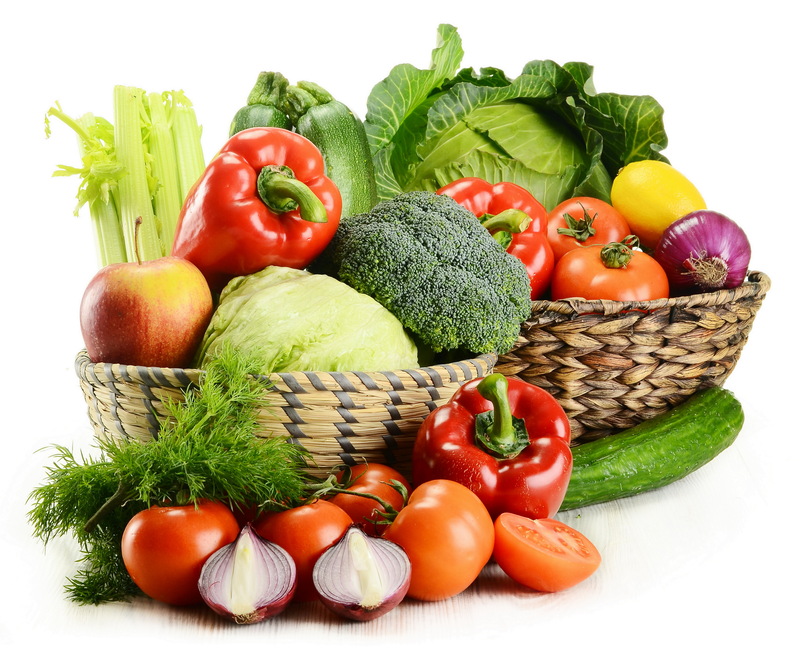 (I combined them all in a bowl to make it a little simpler.) You may need to use your hand to compress the cheese. Top with the remaining bread slices, buttered side up. To grill: Heat a large nonstick skillet over medium heat for 2 minutes. Put the sandwiches into the pan, cover and cook for 3 – 5 minutes, until the undersides are golden brown. Turn the sandwiches, pressing each one firmly with a spatula to flatten slightly. Cover and cook for another 3 – 4 minutes, until the undersides are well-browned. Remove the cover, turn the sandwiches once more, and press firmly with the spatula once again. Cook for 1 minute, or until cheese is completely melted. Not hungry now? Pin for later! 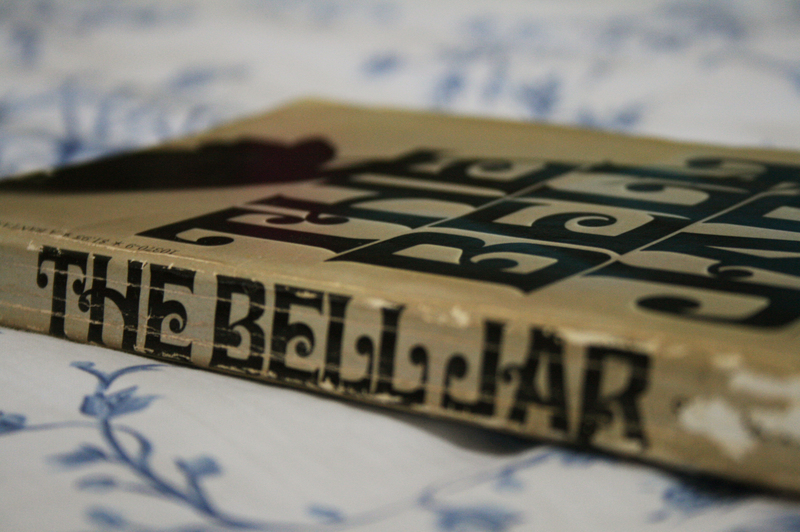 I have this in my To Read pile! Waiting for some sourdough to come my way, now I have a great recipe for my reading. Thanks friend.